Mechwarrior Online Declares "Mech Combat Month"
It's "Mech Warfare Month" at Mechwarrior Online and that means we finally get a look at what awaits inside the cockpit. Strategy, tactics, "information warfare" and all the rest of that stuff is all very nice, but when you get right down to it, Mechwarrior fans are all after pretty much the same thing: massive, heavily-armed behemoths beating the holy hell out of each other. And now that Piranha Games has declared March to be "Mech Warfare Month," it's finally time to talk about the nuts and bolts of battle. Even as just an overview, the first dev blog look at mech warfare is huge, covering topics ranging from the basics of mech locomotive capabilities to heat management, weapons systems, HUD, jumpjets, targeting systems and more. This is serious business, people, and Piranha doesn't seem shy about telling gamers that they're not going to just jump in and go. "Because Mechwarrior Online is more simulation than arcade, one of the more challenging things to learn is how to use throttle," the studio said, a statement sure to please old-time mech pilots. "There is no sprint/run button for MW:O. Once a throttle level has been chosen, the BattleMech moves forward at that speed until throttle is reduced. This is a little more confusing than your typical first-person shooter." Heat will of course be a factor - override at your own risk - and onboard ammunition will be susceptible to explosions caused by overheating and armor breaches. 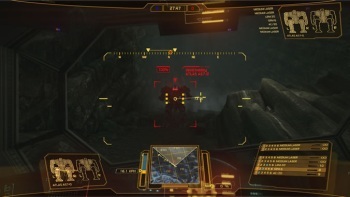 Up to six weapon groups can be defined, while targeting systems will offer five different levels of information on enemy mechs, based on line of sight and duration of contact. All that information and more will be splayed across an intimidatingly detailed HUD. This is ridiculously hot stuff by just about any measure. Arm-mounted weaponry can actually be targeted independently of the torso, meaning that with practice your mech could be moving in one direction while firing in two others. Has any other Mechwarrior game ever done that? It sounds brilliant, and there's more to come. If you're any sort of Mechwarrior or Battletech fan, I think it might be time to start getting excited. If you're interested in Steve Butts' impressions of the demo of Mechwarrior Online, check out his preview from GDC 2012.